A couple from Lanús recorded the transit of an unidentified flying object (UFO) while a religious ceremony was being held at this Buenos Aires district. A morning paper reported today that on November 7 , when the tenth anniversary of the manifestations of the Virgin Mary were being conmemorated at a town square in Lanús, a teenager witnessed the slow transit of the craft, while dozens of participants in the ceremony looked on. 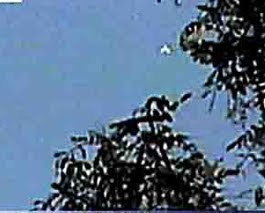 It was then that Julio Guillermo Farkas and Adriana Cetroli recorded images of the object on their camcorder. Once the object had gone, Farkas and Cetroli provided details of the event to researchers Daniel Valverdi and Jorge Marrón from the prestigious Código Ovni group.